Did you know 2019 is our 50th anniversary? We rely on the support of our members, volunteers and patrons to operate. Thanks to your help, we can offer all the FREE material on our website, protect and share all of our collections and materials, host free public programs and just keep our lights on, and doors open! We hope to continue for another 50 years, so please consider contributing to our mission in some way; we would be very grateful for the support! Become a member. By becoming a voting member of the society, you can help move the Society forward, while preserving and sharing our past. We keep membership dues low to include more people. Members also receive our Quarterly historical magazine, which is mailed 4 times per year. Make a monetary donation. We use your monetary gifts of any amount to cover utility and operating costs, equipment repairs, and host programs. We accept cash, money orders, or checks. Thank you! Purchase a publication. We have several CDs and books for sale. We also sell our copies of our Quarterly historical magazine. These make great low cost gifts for friends and family! Share an energy credit. Because our roof is slate, solar panels are not an option for us, but if you have energy credits you are willing to share, that would help reduce our electricity costs and put our financial resources to better use. 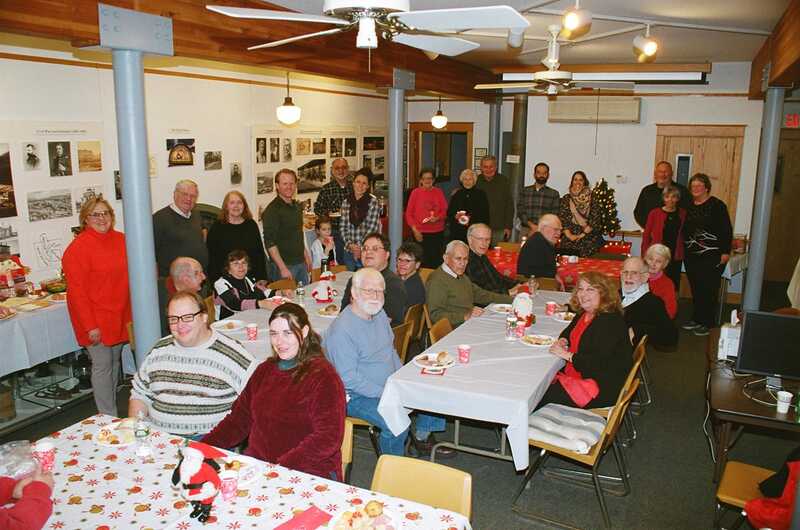 Volunteers gathered for a holiday celbration in December of 2018. Volunteer. We are always in need of more help, and welcome different skills and knowledge. Donate items for our annual sale. We also accept material donations that we can sell at our annual tag sale in October. Proceeds from this sale go directly to our preservation fund, created for purchasing materials needed to preserve our collections. Generally, we accept most any sellable item we can fit in our building, but cannot accept clothing. Please contact us prior to dropping off items. Memorial gifts in any amount will be gratefully accepted. Consider naming us as a recipient for memorial gifts in memory of your loved one. Become a Benefactor. Remember us in your will. No donation is too large or too small. Also, consider a donation of stock or other property. The Rutland Historical Society, Inc. is a 501(c)(3) non-profit organization and donations are tax deductible.